If you follow me on Pinterest, you’ll have seen these already. Here’s some links to other people describing interesting and useful techniques. Enjoy! Afterthought gussets for an afterthought heel (at the bottom of the page). Furniture feet – felted socks for furniture legs so they don’t scratch the floor. Making binding off in the middle of the row tidier. twice-knit knitting – dense fabric that doesn’t stretch and won’t ladder if it gets a hole. And yet, it’s knitting. I’ve seen this in a Montse Stanley book, but it’s the first time I’ve seen it online. How many stitches will fit on a circular needle – estimates based on gauge and needle length. Handy! No-sew rag rugs – the strips are attached to each other while the braiding is happening. Intriguing! Making a long, narrow, striped pom-pom kind of thing – I used a technique like this to make a tail for my son’s Hallowe’en costume a few years back. An easy way to accurately pleat ribbon for trim. I don’t like skirts with long slits. 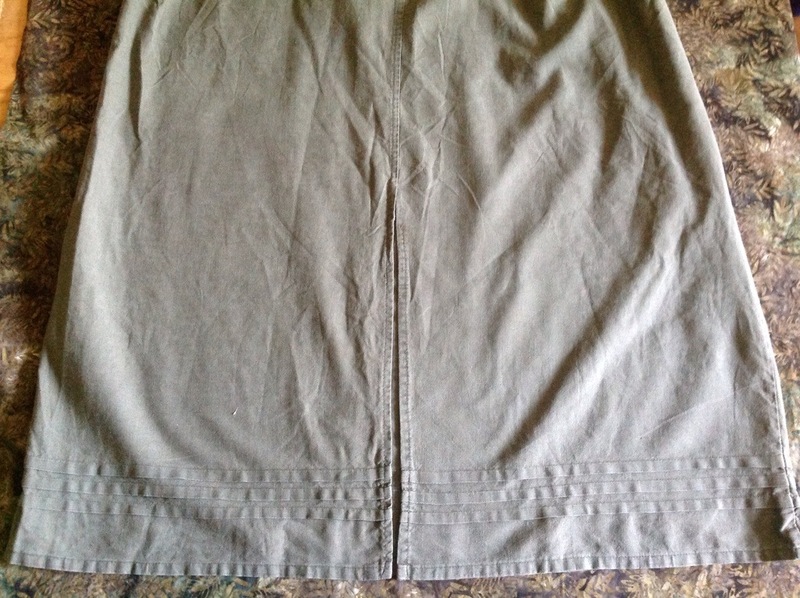 I liked this skirt at the thrift shop, but knew that if I were to sew up the slit, I wouldn’t be able to walk. But I had an idea. Why not put in some contrasting fabric as a reverse box pleat? How to Crochet Bobbles in a Knitting Project <- what it says on the box. Making a string of double crochet circles that are attached to each other without cutting the yarn. So much love! A bag to hang a gadget from its recharging plug. The bag that’s shown is sewn, but it would be easy enough to improvise a knit or crocheted one. Fixing a too-big jeans waistband; good for those of us with a small waist compared to our hip sizes. Requires a sewing machine, though. One way of using chain stitch to attach blocks to each other. Random links. I’m going to be using my sewing machine again soon. Can you tell? Make easy plaid (or vertical lines) on your knitting with a crochet hook and chain stitch. Sew these ribbon holders, useful for headbands, or, you know, circular hooks or needles. Sewing darts with a single thread in both sewing machine bobbin and needle. I must try this; human ingenuity is immense. Popsicle stick rigid heddle looms for use with a simple backstrap loom setup. Sewing narrow hems on the sewing machine.